Welcome to Kawashima Ryokan. 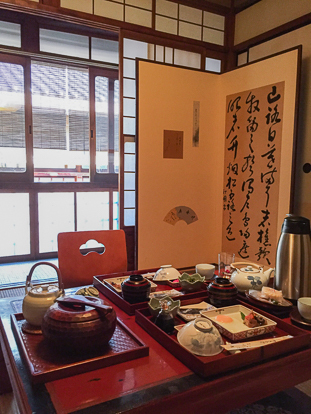 This Traditional Ryokan is conveniently located near many of the best places to go sightseeing in Kyoto, including the historic Gion district and a number of old temples. This traditional ryokan has been in business since 1901, and it is currently in its third generation of family ownership. 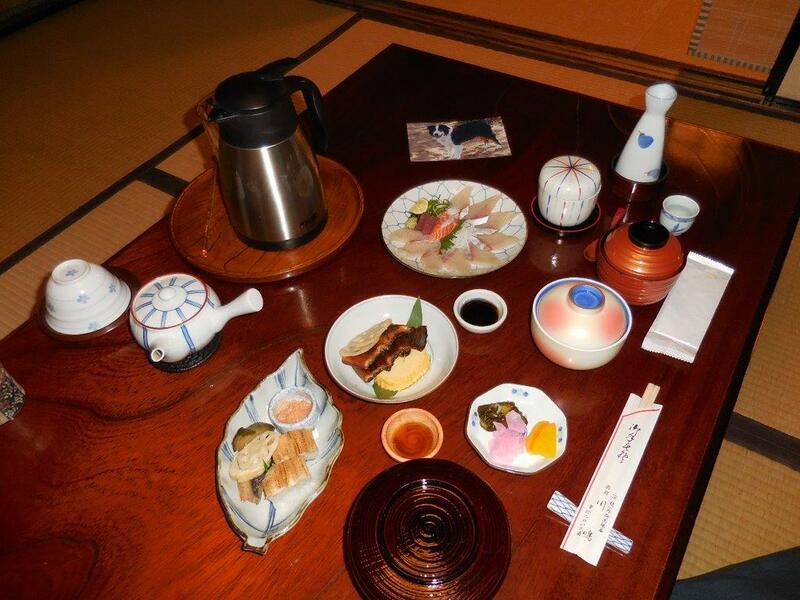 Traditional Japanese meals are served to guests at Kawashima Ryokan. Check-in time is after 15:00 and check-out time is before 10:00 am. English and French are spoken. 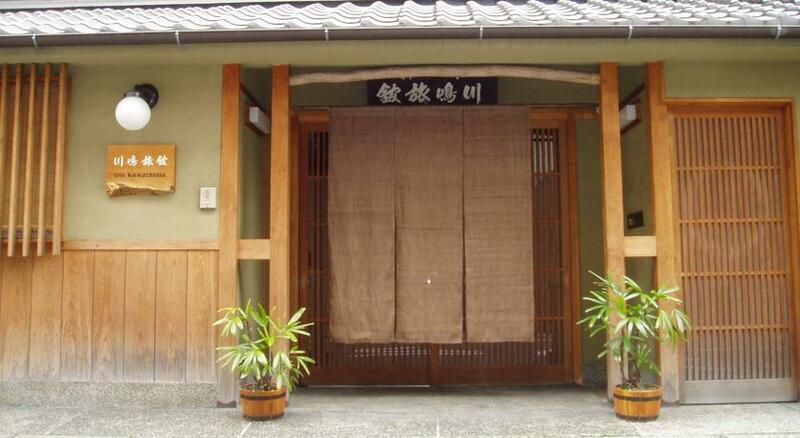 There are 5 rooms at Kawashima Ryokan. They only have one bath "Family Bath" that guests use one (or small group) at a time. I had the pleasure of staying here for a few nights during cherry blossom season. The building was charming, the accommodations comfortable, the owners extremely kind (plus they had an adorable daughter! ), the breakfast amazing, and the location (right near Nishiki Market) perfect. I can't wait to stay here again someday! Thankful for the lovely room for a one night's stay for one person. I had both dinner and breakfast served and it was absolutely delicious and well put together. The guesthouse was located away from the main road but also close enough to plenty of resturants and shops. Room was also clean with enough space to walk around. Do take note that bathrooms are located on the first floor so u will have to use the stairs to use the bathrooms. Also that the walls are relatively thin so u can hear others. Keep that in mind so that u can also be a considerate guest towards others. First Ryokan experience – good! 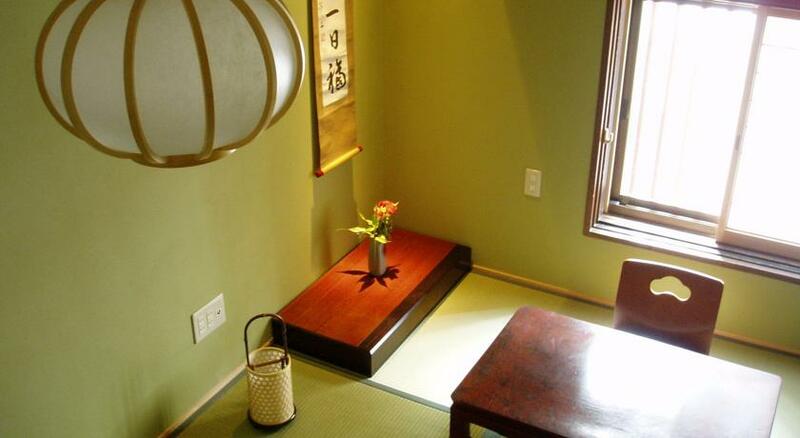 We were looking to experience the basic, traditional accommodation of a Ryokan in Kyoto and this proved to be perfect. Well-located for transport, sightseeing and restaurants (see other reviews), the owner spoke good English, was helpful in providing information and maps and served my first Japanese breakfast. Our first floor room was clean, the beds on the floor more comfortable than at first sight although the rice-filled pillows took a little getting used to. No problems with access to communal washing facilities. The room, although private, is very much a shared space – the walls are very thin – and consideration for other guests is necessary. Overall, I found it a positive introduction and insight into a small part of Japanese culture. Arigatou gozaimashita! This was a lovely ryokan with atmosphere and in a good location. We stayed as a group and booked three rooms. All rooms were a good size especially the biggest room which had a separate sleeping area. The lady that greeted us was warm and welcoming and helped us plan our day of sightseeing with suggestions for what to do. The staff all spoke very good English. We arrived early and the ryokan looked after our bags for us. The shared bathroom was immaculately clean and the bath hot. We didn’t have the chance to eat there as we ate out in the local area. You’re spoilt for choice with excellent local restaurants and a cafe across the road. A really lovely place to stay. Our 9 year old daughter had a brilliant time there too. We’d definitely go back. Stayed for 1 night and really enjoyed it. The rooms are beautiful, and we were impressed to arrive to hot tea and a cookie. Great walkable location a couple blocks from the subway, a couple shrines, and a good night life area. The room was lovely. The location was great. I would not recommend staying here if you have children or want to have a conversation with the host. We were greeted by an unfriendly woman upon arrival and then completely ignored the entire stay, except for one afternoon (it was raining and 2:30 pm), our children were laughing in the room and the same unfriendly woman stood outside our door and said: “silence please.” They immediately stopped laughing and we were very uncomfortable. The host never talked to us except to ask us to pay the bill. If you don’t have children and/or don’t want to have a conversation with the host it might be ok. When I looked through the Japanese Guest House choices of ryokan in Kyoto, I looked at the choices, read all the guest reviews, then made my decision: INN KAWASHIMA. What I was hoping for was a small, quiet, friendly 7 night stay in a Traditional Japanese Ryokan. INN KAWASHIMA WAS EXACTLY WHAT I HOPED FOR...AND MORE! 120 years owned by the same family, I found the owners to be extremely approachable, friendly, and helpful. They both speak excellent English and they have furnished this Ryokan with authentic décor and lots of pride: tatami mat bedrooms with comfortable futons, lacquer tables, floor chairs with cushions, daily fresh towels and yakata. I ordered 2 dinners and 3 breakfasts that were beautifully presented in my room and were delicious to the eye and the stomach! The Japanese attention to detail is lovely! The shared bathrooms, sink, and bath worked out fine amongst all the guests. The interior garden is peaceful and beautiful and I made friends with the gold fish. I love the old neighborhood where it is located. Ample access to subway, buses, taxis, family owned small shops and proximity to larger business and shopping streets. 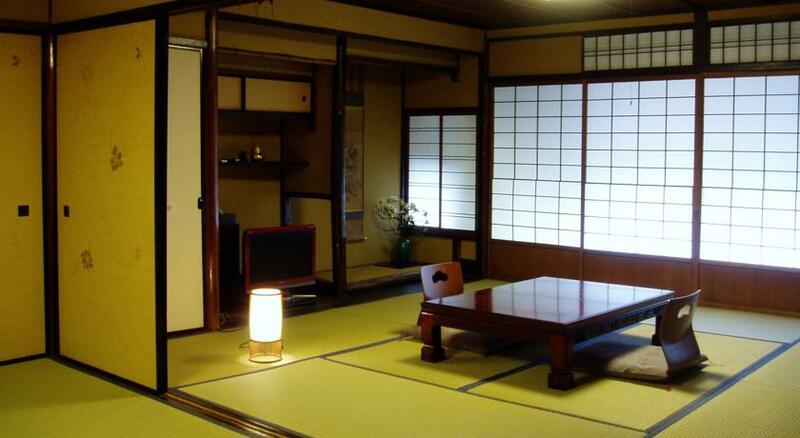 I highly recommend this ryokan if you want to stay in a traditional Japanese home. As with most ryokans, they are 'hidden' 2-3 blocks off of main avenues with easy access to subway. I had 4 nights in Kyoto but had to move from the first ryokan to this one due to booking. No toilet in this room, quite similar in other regards to the first Kyoto ryokan but this was $20 more per night. I thought that a bit strange. I did not eat there so have no experience one way or 'tother. 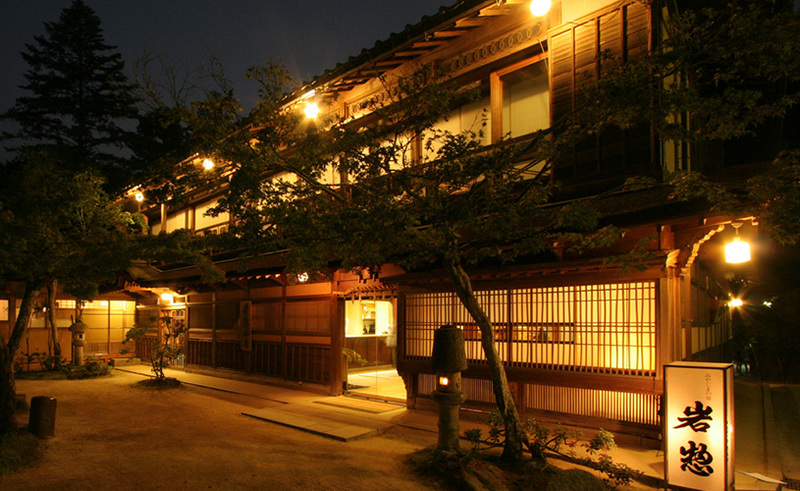 This is an excellent traditional inn, just off the heart of the shopping district in Kyoto. Good facilities, comfortable rooms, friendly staff, tasty breakfast (Y1400 extra), and a lovely little garden in the centre. Just be warned that the steps up to the second floor are very steep, especially for those carrying heavy luggage. One block from the main shopping strip and five minute walk from Gion and the geisha district. Lots of buses within walking distance and subways are also close by. Kawashima Ryokan was a wonderful stay. Perfectly located in central Kyoto. We were greeted by one of the innkeepers and her children. The little indoor garden (nakaniwa) is a precious relief in the morning or afternoon with its lush greenness and cute goldfish. Yes, there is one toilet for women and one for men as well as a changing room, shower, deep tub and two sinks for the entire place, but we never had to wait. When we went up to our room it was large and well appointed with enough space for us and our things. The tatami mats were real! Typically many mats are now synthetic. There's nothing like the feel of real soft mats. 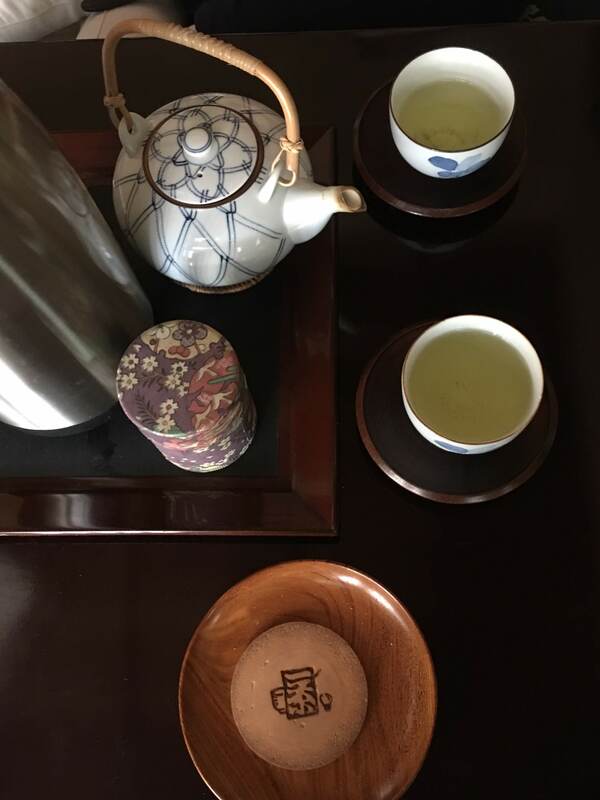 There was hot water, Genmaicha, and two treats waiting for our arrival. They also had a very good air conditioner for the room, but we did turn it off during the day when we were not there. It cooled the room quickly. It was surprisingly quiet, even though we had a large family staying next to us. We could walk to all of the important spots (Temple, shopping, restaurants, Gion, Nishiki Market, et) in downtown as well as easily get a subway, bus or train to anywhere. Our host was very nice and friendly. He speaks English very well and was helpful. He's got a great sense of humor and we appreciated it! I'd recommend this to anyone. I only wish I had opted for one of the meals - the cooking smelled lovely! Beautiful traditional ryokan with delicious Kaiseiki dinner! Host was charming and had a perfect command of English. Was a memorable experience to stay in a ryokan, enjoying the peace and quiet of Kyoto. Kawashima ryokan was a delicate surprise. Although the bath and general facilities are not large, the owner speaks perfect English, which was not required but definitely helpful :) Kawashima is close to amenities such as metro, train, cleaner. The little garden in the middle gives an eery sentiment of otherworldliness at night, and you can walk from it to a lot of daytime sights in Kyoto, and definitely walk back from many a nighttime leisure and eating spots in Kyoto. Definitely recommended and would go back again. 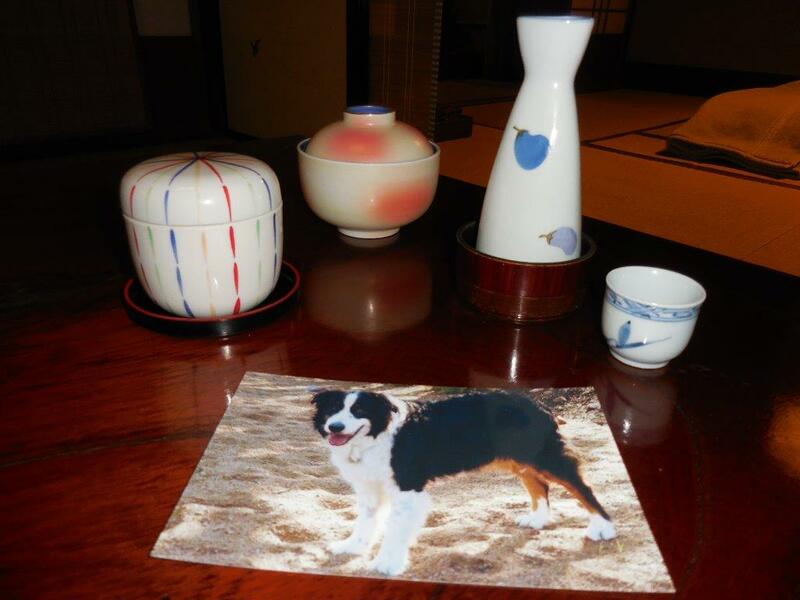 In the busy center of Kyoto you would not expect such a quiet and traditional japanese home with every thing you need. Everything is close by: Nikishi-food-market, post-office, laundry, high class restaurant, izakaya-shops, famous temple with a 600 year old ginko tree, train-subway-bus-stations... Just perfect, with a very nice and helpful hostfamily. It was our last night in Kyoto and I wanted to sleep in a beautiful traditional ryokan after a shukubo and a guesthouse in a traditional japanese home. 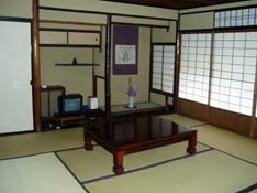 The ryokan was little, but our rooms was perfect, with TV and yukata(the air-conditionning was very noisy ...). Futon were really confortable and the breakfast was delicious. The perfect japanese breakfast according to me. Bathroom with the bath is really nice too. However, after our nights in the traditional japanese home and the temple, that night was not as exceptionnal as we thought ... But everything was really nice. Thanks to the hostess. Kawashima Ryokan provided the Complete Japanese Experience that we were looking for, with unforgettable dinner and breakfast served in the room, Yukata to war after bath, sitting and sleeping on the tatami mats. Nice arrangements for a big group of 6 people, with sliding doors between sitting and sleeping area. Perfectly airconditioned in the hot Kyoto summer. The host could even help us with cold beer for the dinner as we forgot to buy them ourselves before arriving. 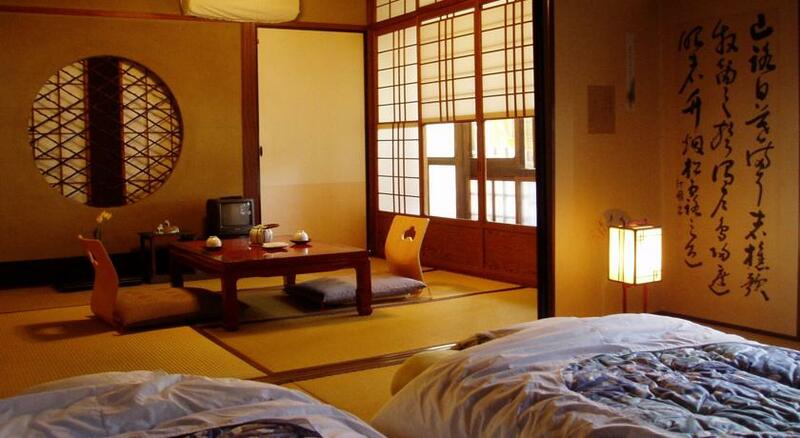 I warmly recommend treating yourself with a stay at this Ryokan. 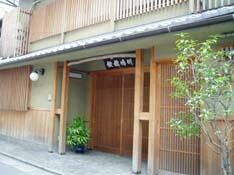 Kawashima Ryokan has a great location in central Kyoto. There is a Sake Bar across the street directly opposite the room I was in which became a little rowdy around 11.00- 11.30pm on a Friday night, but then went quiet afterwards. Like most of Japan I find the cities to be very quiet considering their density and size. My room was large and roomy, but I really think that most Ryokans, not necessarily just Kawashima, could make an effort to provide at least a stool (Japanese style of course) to augment moments whereby people of an older generation might need a stool to put on socks or similar situations. Also some kind of open clothes rack (timber) to hang clothes would be appreciated. My main disappointment with this ryokan was that the mens toilet smelt badly at times, mainly due to lack of ventilation being an internal room. This was a bit off putting and offensive. So thats my negative comments out of the way. Overall though I was happy with my stay at Kawashima considering my above comments, great location, friendly English speaking owner clean and tidy. We were very pleased with our ten day stay. Quiet, peaceful, and very well located. Excellent meals, adequate space, good air conditioning when we needed it. Very gracious and helpful host. We would definitely stay there again. This ryokan was a wonderful place to stay. The food was great, the host very hospitable and organised a traditional breakfast for us even though we hadn't included it through our booking. There were beautiful design features all throughout, and a great location, right near the station and main street attractions. One thing I would do is print a map to get there though! We exited from the wrong exit at the station and it took a while to find (despite being only 3 mins away). It was a fantastic stay, would love to stay again. The guest house was easy to find and centrally located in Kyoto. Just a few blocks away are lovely stores and the famous Nishiki market. The host was kind and provided a great traditional japanese breakfast for both days of our stay. He also helped me book a reservation at Kikunoi which was mighty helpful. The one thing that I found missing was there wasn't exactly an onsen or sento setup. There is a bath in the washroom, but it's not really the same as a full on bathhouse-like setup. Also, the room and house in general was kind of cold. Other than that it was a wonderful stay and I would recommend it again. This ryokan is very quiet, which helped make our stay relaxing and peaceful. The room we had was spacious enough for my husband and I. The location is near bus and train stations, and shopping areas. It is also a good 15-min walk to Gion. There were only a few rooms so it was manageable to share the toilet and bath with the other guests. The hosts were really helpful and friendly. When we arrived, we asked for directions and which transportation (train or bus) to take. We were given an area map and we marked our target destinations. They were more than willing to answer all our queries during our stay. We stayed at the second floor and the stairs had very small steps so carrying our luggages was quite a challenge. Overall, we had a nice stay at this place and would recommend it to others. Totally lived up to our expectations. We were delighted to offer our children a traditional authentic Ryokan stay. The wonderful food was beyond compare, surpassing many of the 5 Star dining experiences. Our host spoke perfect English, though remained reclusive. We found him approachable, extremely courteous and accommodating. The owner was very considerate and quick to cater to our needs. We booked the wrong dates and turned up a week early but we were still treated to a lovely ryokan experience. We had a 9 month old baby and the owner drew a bath for our baby that was ready to go when we came back from sightseeing in the evening. The food was delicious and healthy and the location fabulous. Just three rooms in this guest house, and two overlook a beautiful little garden. Ours was one of these two, on a floor by itself, spacious and pretty. Also worth noting: not only does the owner speak excellent English, but he was very kind and helpful, offering to move us downstairs when we arrived (my mother had an injured foot) and helping me to find vegan food in the vicinity. While the food at the inn is not vegetarian, I have it on good authority that it was delicious :) I will certainly be recommending the Inn Kawashima to anyone I know who plans to visit Kyoto, and hope to stay there again myself some day. In the hussle and bussle of such a large city, this ryokan offers everything you need to relax and unwind the city-impressions. It was clean, the food was wonderful, the staff very friendly, the room was good as was the bathroom. Shijo street is closeby, but you don't hear anything of that. The neighborhood quiet and lively at the same time. The owner speaks very good english. My husband and I spent two nights here as part of our honeymoon. It was both of our first times staying in a traditional ryokan, and I'd say it's definitely an experience everyone going to Japan should have at least once. I slept better than expected on the futons on the tatami mats. I think the house coat kimonos they give you are called uppawari, and it was fun to wear those while walking around in the provided slippers. 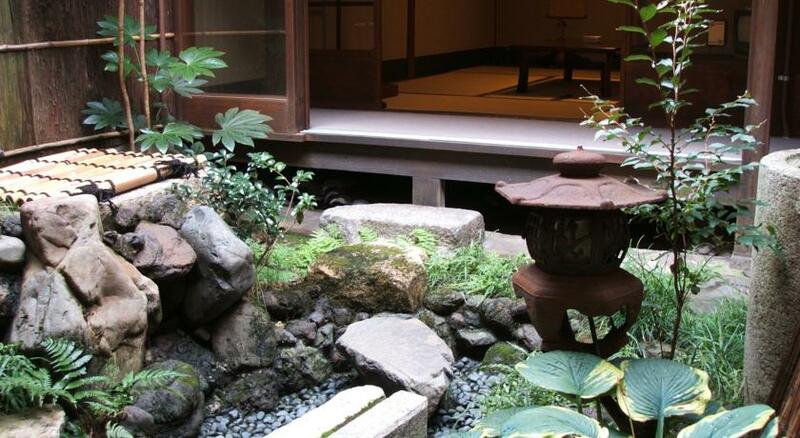 The ryokan is beautifully designed, and there is a pretty little zen garden in the middle, which can be viewed from one of the second floor rooms. The first night we were there, we were in a room that faced the street, so there was noise from the cafe below and the traffic going by. Although I slept through the night, we requested to be moved to a room further from the street, since we get enough traffic noise at home in L.A. The room where we slept the second night was much bigger and even had two rooms- one for sleeping and the other a living room. Megumi was one of the innkeepers, and she was very kind, giving us directions to places we wanted to go, and bringing us breakfast at the scheduled time. I would recommend you order a Japanese-style breakfast if you stay here. It really adds to the atmosphere and the experience. Access to the bathroom and toilet was not a problem, even though they were shared with other guests. I should probably mention that I got a LOT of mosquito bites while we were staying here, so if you're going in early fall or in the summer, you might want to have some bug spray or something. Just for variety, I might try another place next time, but I would recommend Kawashima to other travelers for sure. Stay with a travelling companion for 4 nights. This is a family-run ryokan. The host is able speaks English thus it's easy for check-in and to request for things. This ryokan is great as a base to explore Kyoto as it is located near 2 subway lines which goes from North to South and East to West. Bathroom, toilet is shared among guest and the host family members, bathroom door can be locked. Recommendation is to use the bathroom during late afternoon so as not to be waiting too long for a bath. The guest rooms are located on the 2nd level and you would have to take the stairs to get there, 2 rooms are facing the small street. We were assigned one of the rooms which was directly facing a cafÃ©/bar across the street, it might get a little noisy at night as the patrons bid goodbye, it won't last long, so fine for us. The room is big enough for us. Flask are refilled daily and Teacups and pots are changed daily with new snacks everyday. Overall this is a good place to make as a base to travel in Kyoto. I will want to come by again, especially that they support solo travellers. Kawashima Ryokan has a great location on a quiet side street in central Kyoto, near a metro station, huge semi-outdoor market and the Pontotcho nighlife area. 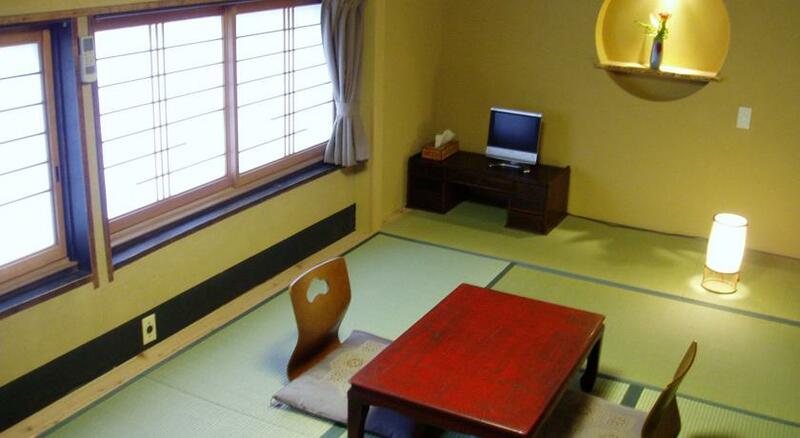 It's a traditional Ryokan with paperthin walls and only one bathroom for the whole facility. Noise from the streets however wasn't a problem at all, since there's very little traffic. The only problem is the indoor temperature. It's freezing cold in December. There's a heater in every room, but once you turn it off, the place gets cold very quickly, since there's hardly any insulation. Therefore you have to keep it running through the whole night, which is quite annoying. So keep that in mind if you're coming here in the winter. The food was excellent, both the breakfast and dinner. While only two toilets and one bathroom might be a problem on a busier time of the year, we didn't actually have any problems at all with this. There were other's there but it seemed they were on a different showering rythym than us... The guy running the place was very helpful and spoke very good english as well.